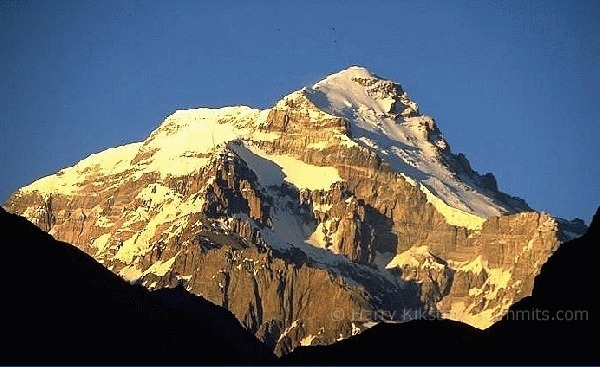 Aconcagua, the 'stone sentinel' is a mountain with many faces, situated near the Argentinean/Chilean border. 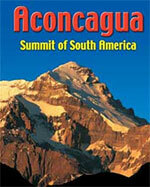 Aconcagua is often underestimated which has resulted in serious injuries and death, mostly on the normal route. The extreme cold, stormy winds and altitude make this mountain a serious undertaking. Enjoy the summit of the Andes! Use the Aconcagua menu on the left (or the dropdown menu above) to browse through our trips, the routes, pictures/ecards of Aconcagua and more. Trip bookings: sign up using the bookingform or email us for special requests! Height 6962 meters or 22,841 feet. This makes it not only the highest peak of the Andes and South America, but in fact the highest point outside of Asia.